A cab driver was not injured after an artillery gun struck his vehicle in Nanaimo. Witnesses report that the gun came loose from a Canadian military vehicle leaving Maffeo Sutton Park around 2 p.m. Saturday and rolled down a hill and hit an AC Taxi cab on the corner of Comox Road and Terminal Avenue. When you look closely at the second picture showing the gun from the back, you can see some form of safety chain connected to the spades and what looks like the taillight cable hanging down. Makes me wonder even more what happened here. Makes me wonder even more what happened here. Section 666 of the NDA: "In that he was stupid..."
What does the sign on the gun tractor say? Recruiting for Army Reserve? Bit hard to read but it looks like "Official, S something?, G something?, presented? by 5 (BC) Field Regiment Royal Canadian Artillery Army Reserve"
I wouldn't call it "cheap". That's going to cost a few bucks. As long as the gun suffers no real damage, the taxi will be easily repaired or replaced. Expect to see a news article 'DND Spending Out of Control' as a result! Doesn't seem to say anything about attaching safety chains. Am I reading it wrong? IMHO "satisfies himself that the equipment is ready to travel" - pretty much covers it! #1 circles the gun and vehicle before mounting. As this was a recruitment drive, there may be no Detachment Commander in the sense it is used in gun drill. Likely the Officer and/or NCO in charge for that day will be in trouble for not properly supervising the hookup (generally 4 people to lift trails). Plus the driver. This is assuming something went wrong and not something broke. If there was the remains of a cotter pin in the pintle hook and it had been in the closed position, then unlikely anyone's fault. In which case a fleet wide order may come down to repair/replace suspect components. That was my thought. The gun drill is written for when a detachment is doing training or in operations etc and, yes, as a Number 1 I always quickly walked around the gun and always checked the pintle, the pin, the latch on the panoramic scope box and the hand breaks [which are the responsibilities of the Nos 2 and 3] to make sure the gun was ready to travel (safety chains are not part of ordinary gun movements - just long administrative road moves and the like) Incidentally when working as a detachment, the driver does not leave the cab of the vehicle while going either into or coming out of action. He stays in the cab ready to move the vehicle as directed by the No 1 and in fact in coming out of action he backs the vehicle into the gun which is when the Nos 6 and 7 [one on each side of the trails nearest the pintle] cooperate to lock the gun into the pintle and pin it [at the split second that the truck stops] and then mount. It may have been here that there was no real detachment involved which should mean that whoever was lifting the trails into the pintle should have locked and pinned it and whoever was in charge of the group involved in hooking up the gun should have checked that it was properly locked in and brakes released. I don't suspect a mechanical problem with the pintle or pin. We've used those for a half a century now and they are very simple and robust parts and take a lot more punishment in the field then they would ever get on a paved road. I still wonder about those chains though. I'd love to see a close up photo of both the pintle and the spades/chains. Maybe I am showing my age, but I always thought the pintle was used as the point of contact to anchor the top carriage to the borrow carriage, and then was the pivot point for traversing. Perhaps more relevant, the handspike appears to be missing from its place on the left trail, which suggests this was a non-operational or administrative move, taking the gun from point A to point B by a non-qualified group. 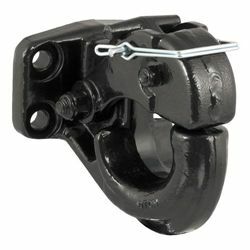 Is called a "pintle hook" or "pintle" for short. Pintles like this are on the backs of all our trucks. What you are thinking of is another type of pintle which is one type of a weapon mount. You being an IG would of course be an expert on all things gun. Pintle however is a generic term that goes beyond that. First time I have encountered pintle used in that context. We used to call them "tow hooks" in the context that the gun is hooked in. The issue remains that we don't know what happened, but it shouldn't have. So we go into wait and see mode. I think Pintle hooks came into use as some can rotate on basically a pintle. I suspect that sloppy language crept in over the years. As for the missing handspike, likely in the cab to prevent it being lifted by some souvenir hunter. Speaking of artillery, do you guys know why they changed the name from artillery soldier to gunner? The term gunner came into use a very long time ago, shortly after "guns" were invented and came into service with armies across the world. Within the British military, the term "gunner" was not only a descriptive term for all artillerymen but also a rank equivalent to private. Within the Canadian artillery the trade to which gunners belonged was called "artilleryman" well before females were permitted to serve in the combat arms. Once females were permitted to serve the term "artillery soldier" came into use in our advertising campaigns. Within the trade, we have always and continuously referred to ourselves as "gunners". IMHO the term "artillery soldier" (like "armoured soldier" and "infantry soldier") always sounded stilted and contrived. The change in our advertising to the term "gunner" is in my view a good choice because 1) it gets back to the use of a traditional term rather than a made-up one and 2) is nonetheless gender neutral. While I don't have details as to how the change came about, I would suspect that there has been an ongoing campaign by the Colonel Commandant and the Director of Artillery and various other senior serving and honourary artillery officers to influence the system to adopt the change.